The new report released by WorldFish summarizes the results of a systematic effort to explore possible futures for aquaculture and fisheries in Indonesia. The work described is part of a larger effort that seeks to develop a shared vision for the sectors that 1) aligns public and private investments to foster growth and economic sustainability; 2) reduces environmental impacts and improves efficiency; 3) increases access by small and medium enterprises to the financial and technical assistance necessary to transition to more sustainable practices. Between July and December 2014, three workshops were held, one at national level and two at provincial level (Lombok and Makassar). At each workshop, participants from the government, the private sector, and the research and nongovernmental organization communities worked together through a structured process to arrive at a series of scenarios for the Indonesian fish food system in 2030. 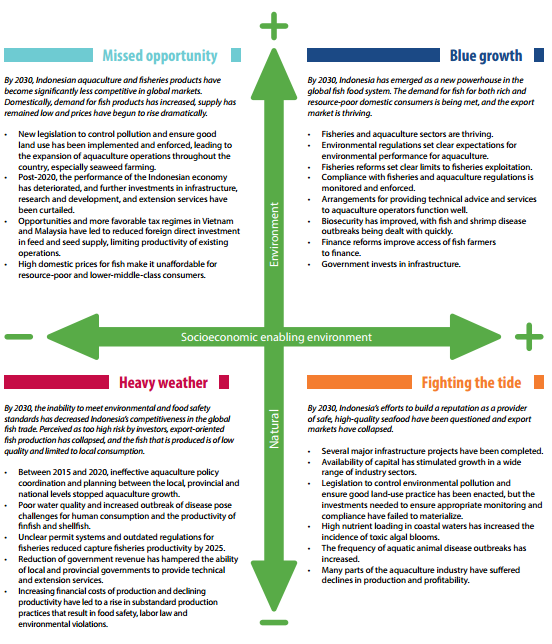 Articulating these possible futures is the first step towards enabling decision-makers, land managers and communities to make informed choices concerning environmental tradeoffs among different growth options and to identify the public policies and investments needed to create economic opportunity for economically and environmentally sustainable growth for the Indonesian fisheries and aquaculture sectors. Drawing on the conclusions from the three workshops, an integrated scenario frame emerged based on two key uncertainties: the natural environment and the socioeconomic enabling environment. The environmental uncertainties include the extent to which society controls pollution and other aspects of environmental quality and the resultant effects on water quality and environmental services. They also concern the degree to which climate change will increase the frequency and scale of extreme weather events. Uncertainties in the socioeconomic enabling environment include how market conditions, policies and regulations will evolve. They also include the extent to which the financial regulatory climate is supportive for the growth of the sectors directly, as well as whether broad infrastructure investment takes place. 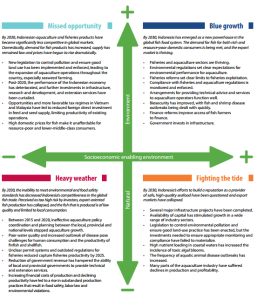 This work is part of PIM's research on Global and Regional Foresight Modeling Tools and was co-financed by PIM through the Global Futures and Strategic Foresight project.